Threads Per Inch, the pitch of a threaded fastener. Threads Per Inch of cloth. This is a common spec for tires. The higher the TPI number, the thinner and more flexible the tire fabric is. Thin-wall (high TPI) tires tend to be lighter and have lower rolling resistance, but they're more easily damaged by road hazards. An oval track, also known as a "velodrome" for bicycle racing. Track bicycles have steep angles, fixed gears, and no brakes. Common track events include match sprints, pursuits, motor-paced events and miss-and-out races. The Japanese variant, Keirin, is a major betting sport. A fixed-gear hub. Track hubs have a stepped thread, with a standard 1.37" x 24 tpi thread for the sprocket, and a smaller, left-hand thread for a locknut. The idea is that if the sprocket should start to unscrew, it will turn the lockring with it, tightening the left-hand thread, preventing the sprocket from unscrewing. British term for fingerless cycling gloves. An axle nut with a built-in washer loosely riveted to it. The washer is permanently attached, but can rotate with respect to the nut. Used on high quality solid-axle hubs. Cheaper solid-axle hubs use serrated flange nuts, or plain nuts with serrated washers. The act of balancing motionless on a bicycle. This is done most easily on a fixed-gear bicycle. The rider turns the front wheel to about a 45 degree angle and balances with the cranks horizontal. So the wheel can be brought back to straight ahead even if there is toe clip overlap, the crank on the side toward which the bicycle is steered faces forward. If the bicycle starts to lean to that side, a slight forward movement of the cranks will bring the tires back under the rider's center of gravity. If the bicycle leans the other way, rolling backward will correct the lean. This is the same action as putting more weight on the left leg to avoid falling to the left, and vice versa, but it takes some practice and it is easier with a low gear. On the banking of the track, which is bankd and where races are run counterclockwise, the front wheel is usually turned to the right. It is possible to do a track stand on a freewheel-equipped bicycle if the front wheel is pointed up a sloping section of road -- so, on a crowned road in right-side driving countries, the front wheel is turned to the left. The technique must be learned separately each way. The frictional force that keeps a tire from skidding. A tire with good traction will be less likely to skid. Softer rubber gives better traction, but wears out sooner. Paved or unpaved, wet or dry, hard or soft, smooth or bumpy. If the tire is too soft, it can "squirm" and deform itself so that it will not track properly when making turns. If the tire is too hard, it will bounce excessively on rough surfaces, bounding from bump to bump, spending too much time airborne. This is mainly a concern in the case of tires for off-road use, where a knobby tire can get a bite of a soft or irregular surface. For pavement riding, smooth tires get as good traction as those with tread, sometimes better. Aggressive knobby-tread tires corner very poorly on pavement, because the tall knobs bend sideways under stress. Trail is the distance from the center of the contact point of the front wheel with the riding surface to the intersection of the steering axis (head tube) with the surface. The trail is a function of the head angle, the fork rake, and the tire diameter. Trail has a major effect on the handling of a bicycle. More trail increases the bicycle's tendency to steer straight ahead. A bicycle with a largish trail dimension will be very stable, and easy to ride "no hands". A bicycle with a smaller trail dimension will be more manuverable and responsive. Joshua Putnam has a good discussion of trail and Bicycle Steering Geometry in general on his Web site. A device on which a bicycle is placed so that it may be pedaled while stationary. Generally, the front wheel rests on the floor, and there are clamps to support the rear wheel at the ax le.. A roller device rests against the rear wheel to provides resistance by way of a magnetic assembly or a fan. A trainer allows a bicyclist to build or maintain fitness when riding is inconvenient. A trainer does not, however, build smoothness of pedaling or improve balance as rollers do. A person who assists racers or other cyclists in building physical fitness -- as distinguished from a coach, who also teaches riding skills and tactics. The horizontal cable linking the two arms of a cantilever or center-pull brake. Also called a "straddle" or "crossover" cable. In a bicycle suspension, the travel is the total distance that the wheel can move up and down, with respect to the frame. 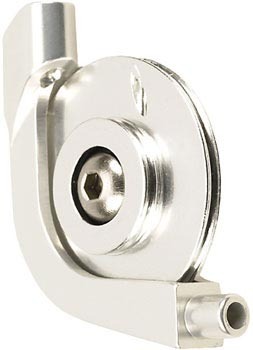 A stepped pulley device from Quality Bicycle Products, designed to change the amount of cable travel. The principal application of these is to permit the use of traditional short-pull brake levers with direct pull cantilevers or other brakes that are designed for long-pull levers. See the Brake Lever Types entry for more details on this issue. Note: the small-diameter pulley will fatigue the cable, resulting in fraying and failure, sooner or later. The contoured surface of a tire, used to improve traction in loose or rough surfaces. Knobby or grooved tread designs have no real value for use on hard paved surfaces, and extreme tread patterns increase drag, noise and reduce cornering traction due to squirm. Despite appearances, slick tires perform best on hard paved surfaces. The lateral distance between the pedal attachment points on a crankset. For most cyclists, the narrower the tread the better. When we walk, our footprints fall almost in a straight line under the center-of-gravity of our bodies. When we cycle, the "tread" forces our feet to be exerting their force farther apart than they are designed to do. Some theorists blame this for knee and hip problems experienced by some cyclists, but the jury is still out on this. A wider "tread" also creates a greater sideways force when pedaling out of the saddle, so the rider must exert more upper-body strength when riding "en danceuse". A wider "tread" decreases pedal-ground clearance when the bicycle is banked over into a tight turn. This seems to me to be basically a bit of marketing hype. "Trekking" bikes are basically indistinguishable from 700c "hybrids" except that they come with a lot of accessories that are not stock on a hybrid, such as fenders, racks and generator lighting systems. Another way of looking at it is that a trekking bike (or a hybrid for that matter) is basically a touring bike with upright handlebars instead of drops. Although the word "trek" is of Afrikaans origin, meaning a long painful journey on foot or by oxcart, I believe the term "trekking" bike originated in Germany in the 1980s. Trials are sometimes done on more-or-less standard mountain bikes, but more often with purpose-built trials bikes. A trials bike is a one speed, geared very low, with a tiny chainwheel both for low gearing and improved clearance. Tires are usually fat 20" or 24" size, with aggressive tread. Frames are small, equipped with a very low saddle. Trials riders never actually sit on the saddle, but a saddle is required as a safety measure. The major technique involves locking the wheels up with the brakes, and bouncing the bike up and down in the manner of a pogo stick. In this way it is possible to climb stairs sideways, etc. A three-part race, usually consisting of a swim, a cycling stage, and a run. The cycling section of a triathlon is run as if it were a time trial. Drafting is forbidden, so there can be no team tactics or other assistance between contestants. The popularity of triathlons has brought many new participants to cycling, and because these participants are highly motivated but not in touch with many of the hidebound traditions of cycle racing, triathletes have introduced many fresh designs to cycling, most notably the æro handlebar. Because of the lack of team tactics, and the tendency to use fairly flat courses for the cycling leg of triathlons, all sorts of ærodynamic parts and accessories have become popular among triathletes. This is helped by the fact that triathlons arenot governed by the U.C.I. and there are very few restrictions on allowable equipment. A shifter for a Sturmey-Archer or Sachs internal-gear hub, mounted on the handlebar, and designed to be operated by the right index finger. This was probably the first handlebar-mounted shift control ever, and replaced the older quadrant shifter sometime before WWII. To make a fine adjustment to the position of the front derailer cage. This is sometimes necessary as the rear derailer is shifted because changes in chain angle can cause the chain to rub on the front derailer cage. Some indexed front shift controls provide a "trim" function, usually an extra click or two, to let the rider compensate for this. In the early 1980s, Sun Tour used to make a special shift lever , the "Symmetric", that automatically adjusted the position of the front lever as the rear was shifted, to automate the trimming process. This system turned out to be very troublesome, and was abandoned after a single season. A crankset with three chainrings. The smallest, inner chainring is commonly referred to as a "granny gear." This term is sometimes used incorrectly to refer to a triplet, a 3-place tandem. Double butted, but with different thickness butts on each end. This term may apply to frame tubing or to spokes. A tandem for three riders. A "true" wheel is one in which the rim is perfectly concentric and runs along a plane perpendicular to the axle. A wheel which is "out of true" vertically will be out of round, and will give a bumpy ride even on a smooth road. If it has splayed sidewalls, it will also cause pulsation of a rim brake. A wheel which is "out of true" horizontally may rub on the brake shoes at part of its revolution, causing excessive drag...or causing the brake to be adjusted looser than it should be to prevent this drag. "Truing" is the act of making a wheel run true. This procedure is described in my Wheelbuilding Article. Very old-established American manufacturer of bicycle saddles. More recently, they're more known for accessory baby seats. Techno Tubo Torino (Technical Tubing Turin) Prominent Italian manufacturer of handlebars and stems. Inside of most modern bicycle tires you will find an inner tube, which is basically a rubber balloon with a valve that fits through the rim so that you can inflate it. The purpose of the tube is to make the tire airtight. The tire itself may have small holes and pores without creating a problem, as long as the tube doesn't leak. If the tire has a large hole or cut, the stretchy rubber tube can bulge through and burst. The tube does not, in itself, have the ability to withstand the high pressures used in bicycle tires without the support of a tire around it. Andy tube will slowly lose pressure as air seeps out through the rubber. Most tubes are made of synthetic (butyl) rubber. The can usually go a week or more without significant loss of pressure. Some tubes have been made of natural latex rubber, for light weight and more flexibility -- but they need to be pumped up at least once per day. Infantile slang term for a tubular tire. Using this term will make you sound like an idiot. Traditional bicycle frames are built out of metal tubing, generally aluminum, steel or titanium. Steel bicycles are built by joining the tubes either with lugs, welding, or fillet brazing. Only welding is used for aluminum or titanium frames. A type of tire mainly used for racing. A tubular tire has no beads; instead, the two edges of the carcass are sewn together (hence the term "sew-up") with the inner tube inside. Tubulars fit only on special rims, where they are held on by cement. Most people find expensive tubulars too expensive for recreational riding...but cheap tubulars are distinctly inferior to good clinchers, particularly in that they tend to be lumpy and crooked. Comparing high-quality tubulars with clinchers, including the rims, tubes, etc, tubulars save about 50 grams per wheel...but your bike winds up heavier, because you really need to carry a complete spare tubular, as opposed to a tube and/or a patch kit. This doesn't apply if the team car is carrying spare wheels/bikes for you. If you don't glue your tubulars on properly, they can roll off, causing you to crash. If you get a flat on the road, you can't glue your spare securely, since the glue needs to dry overnight; as a result, you have to ride very gingerly on your spare, taking it really easy on the curves and descents. If you get two flats on the same ride, you're screwed. Some people believe that tubulars corner better in the rain...but I never go fast on wet roads anyway. If you flat in the rain with tubulars, your ride is over, because there's no way to make a wet tubular stick to a wet rim. Tubulars are fairly immune to "snake-bite" rim cuts, and may offer slightly better "suspension" action than comparable clinchers. Their rolling resistance is actually worse than with good clinchers in most cases, due to imperfect contact of the glued section with the rim, so there is rubbing. Standard size tubular tires use a rim that corresponds in diameter to a 622 mm (700C) clincher rim. Back in the 1970s, 622 mm clinchers were very rare in the U.S., and most sporty bikes used either 630 mm (27 inch) clinchers, or standard (622 mm) tubulars. The fact that these sizes are so close led to an in-accurate habit of referring to "27 inch" tubulars. This careless nomenclature still causes confusion, and people often imagine that there is a different "27 inch" size in tubulars as there is in clinchers. This is not true. THERE IS ACTUALLY NO SUCH THING AS A "27 INCH" TUBULAR. All full-size tubulars fit all full-size tubular rims. There are smaller tubulars, "26 inch", "24 inch" and even smaller, but those are VERY uncommon, mainly used for children's race bikes, which hardly exist at all in the U.S. The smaller sizes are very poorly standardized; tires and rims of nominally the same size may not fit one another. Sarcastic slang term for extension levers. The so-called "29 inch" tire size is not actually a new size, it is just a new marketing term for 622 mm (700C) wheels with fat tires. This size is probably a good option for taller riders for off-road use, compared with 559 mm (26 inch decimal) wheels. Larger-diameter wheels don't sink as far into holes, so they give a better ride in rough conditions. For shorter riders, wheels this large will cause unfortunate compromises in frame geometry, so they're probably not a good option for riders of short or medium height. Idiotic, confusing marketing buzzword referring to the 584 mm (650 B / 26 x 1 ½") Please do not use this bogus designation, let it die a well-deserved death. Tire-sizing is confusing enough without making up new designations for existing sizes. A style of crankset in which the axle and right crank/chainwheel are a single part, and the left crank attaches to the axle either with a cotter or by tightening a pinch bolt that holds the crank to a splined axle. These were formerly usually found on low-quality bicycles and exercise machines of European manufacture. The most common type is known as "Thompson." Most crank sets are three-piece, there are also one-piece crank sets. Shimano revived the two-piece design with the 2004 Dura-Ace "Hollowtech II ® " crank and bottom bracket. These use external-bearing bottom brackets and large-diameter hollow shafts. This system has "trickled down" the Shimano line in later years, and is gradually replacing three-piece cranks on most better quality bikes. Other manufacturers have also adopted this system, which seems to be becoming the new de facto standard.